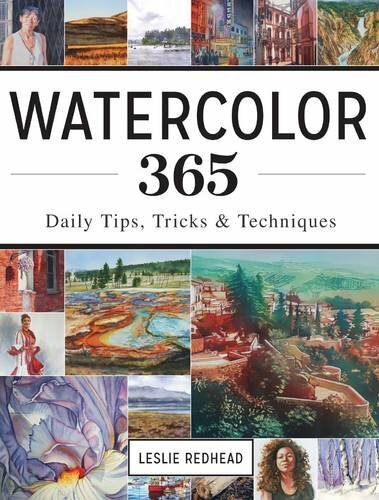 Watercolor 365 is a fun book that features tips and techniques relating to watercolour. This book serves well as a companion to other structured beginners watercolour books. You don't really need to know watercolour first to get this book but it would be highly beneficial if you do. As the title suggests, there are 365 tips, ideas or techniques in the book. The content is divided into 12 chapters, then weeks, then days. The idea of having one nugget of watercolour tip a day is nice, but some of the content are not suitable for this sort of presentation. For example, the first few days talk about watercolour paper. There's one day for paper, another for how it's made, then one day each for hot press, cold press and rough. The text for each day is short and will definitely leave you with a "huh? That's all" and then you'll continue reading. The tips in the later days are better in the sense that they are self contained so you can practice the technique featured or just absorb whatever info that's presented. Note that not all the days feature an actionable hands-on tips. For example, there's one day where it just tells you to understand the properties of water and let the water do most of the work. As for subject matter, the book covers quite a good variety. It talks about the tools, creating interesting textures, glazing, using negative shapes, drawing, portraits and many more. One exercise asks you to paint how a sound would look like. Overall, it's an accessible book with some fun exercises and helpful techniques. The concept of presenting it as one tip a day for a year is a bit gimmicky to me though. This review copy is provided by book distributor Pansing. You can get the book from major bookstores in Singapore and Malaysia.